Apply now for Business Analyst of the Year! We're looking for the Business Analyst of the Year 2019. Do you have a story you'd like to share with other BAs? Could you be an IIBA UK Director? Call for candidates ends on 1 February. A free place at BA2019 will go to someone who completes the survey. Would you like to stretch your training budget further? Some training providers are now offering discounted courses to IIBA UK members. Some of our events are now being filmed and the video recordings are available for members only on our website. The new designation helps apprentice BAs to become part of the professional network right at the start of their careers. Tina Schuster and Nick de Voil have been appointed joint presidents of IIBA UK. Thursday 20 April, 5pm UK Time. Registrations now open! Could you be the Business Analyst of the Year, 2017? IIBA UK Wins Two International Awards! It is with great pleasure that we are able to announce that the IIBA UK chapter has been presented with two international Chapter Awards. We are pleased to announce that IIBA UK Chapter has been shortlisted for three international Chapter Awards. BA Of The Year Finalists Announced! Stop press: This years' BA of the Year finalists have now been announced. Apply now for the Business Analyst of the Year 2016 award! Could you be BA of the Year 2016? Find out more! We're pleased to announce that the IIBA UK team have responded to a government consultation, and we have provided a series of recommendations on how an increased focus on business analysis will be crucial in the coming years. We are pleased to announce that IIBA UK Chapter has received two international chapter awards. These awards recognise the significant ongoing progress that is being made in the UK BA community to promote and elevate the status of the business analysis role. We're pleased to announce that IIBA UK Chapter has been shortlisted for two International Chapter Awards. We're pleased to announce that the IIBA UK team have responded to a government consultation, and we have provided a series of recommendations on how the GCSE Business Syllabus could be enhanced. IIBA has signed a Memorandum of Understanding with four key collaborative partners, including BCS, The Chartered Institute for IT. The results of the 2015 IIBA UK directors election are in. Could you be a director of IIBA UK? Over the next few weeks, we will be holding an election for the IIBA UK board roles that are due for re-election. Submit your proposal to the BA Conference Europe! It's that time of year again where those who are thinking about speaking at this year's Business Analysis Conference Europe in September are getting ready to put their submission in. However, time is running out! We're delighted to announce that we've teamed up with AssistKD to conduct this year's Annual UK Business Analysis Survey. We're extremely proud to announce that IIBA UK chapter has won two International Chapter Awards. IIBA UK recently responded to a consultation run by the Department for Education (DfE), which was examining the content that should be included in the Computer Science GCSE. We are extremely pleased to announce that IIBA UK Chapter has been shortlisted for three international Chapter Awards. IIBA UK members are eligible for a 15% discount on a 2-day pass to the Lean Kanban United Kingdom 2014 event on 3-4 November. The conference features new ways to do portfolio management, work with requirements, and work with improvement initiatives, to name just a few of the topics covered. See the Partner Events page for more details. Congratulations to BA of the Year, Sandra Leek! The Business Analyst of the Year award was presented to Sandra Leek at the Business Analysis Conference Europe 2014. The directors of IIBA UK have submitted a report to a UK Government inquiry which is examining the skills required in the Civil Service. 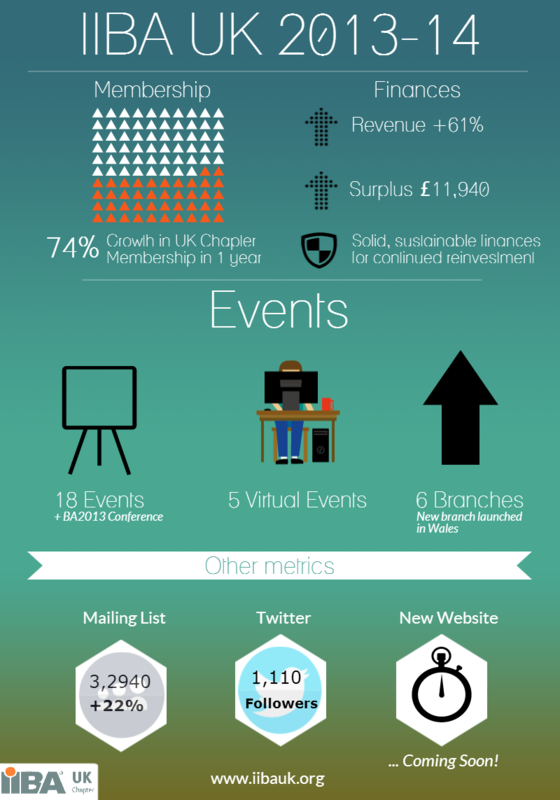 The IIBA UK Annual General Meeting (AGM) was held on 22 April 2014 via webinar. Ellen Gottesdiener, who presented at our recent London event, has kindly offered IIBA UK a discount on her latest book, Discover to Deliver, written with Mary Gorman. To purchase the book and claim your discount, go to the book website, and enter the code DtoDUKIIBA on the coupon page. HMRC has formally approved our application for IIBA to be recognised as a "professional association" for income tax purposes. This is significant as it means that our members will be able to claim tax relief against their membership fees. This has been backdated to April 2013.